I always receive some questions about making terrarium ornaments during the weeks that lead up to the holidays. 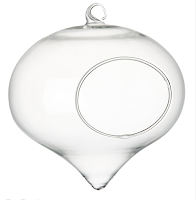 Terrarium ornaments make wonderful gifts, conversation pieces or even tree decorations. However - it is a small vessel in which to build a terrarium environment. How can you ensure your precious project won't be a dud in a matter of days? Do you intend for the plants in your terrarium ornament to last beyond a couple of weeks? If you are using the typical empty ornament that unscrews at the top and then results in a sealed environment - your best bet is to use an air plant or a succulent with a very small amount of soil. The succulent is not going to be happy in the ornament environment indefinitely. Read more about using an air plant for a terrarium ornament in my earlier post. If you are looking for a terrarium ornament to last you beyond the holidays - consider springing for a hanging terrarium vessel like the one pictured above, available from CB2. This larger vessel would allow you to add more soil and the proper drainage layers, and the air hole would allow a plant to grow and extend beyond the dimensions of the container over time. 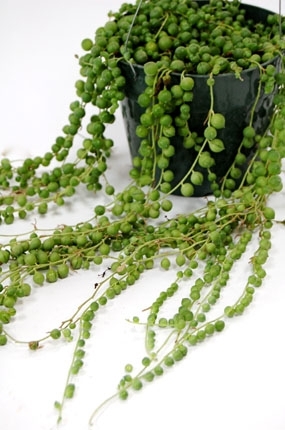 You could even select a plant that would fully utilize the air hole, such as a string of pearls succulent (photo from Inner Gardens).